The debut edition of the Austin Community Foundation’s GivingCity: The Guide for Doing Good in Austin doesn’t quite clock in at that length. But the 92-page online publication shows the commitment of the the foundation and the magazine’s editor, Monica Williams, to use words and pictures in compelling ways to show citizens of the Central Texas city the virtue of philanthropy and how, they too, can give back, and sometimes by getting involved in projects they might not know about without the magazine to point the way. Williams, who produces GivingCity for the foundation, actually wears two hats. In addition to her editor-in-chief title, she serves as the foundation’s director of communications. In that role she focuses on projects designed to help the foundation be better known, support its donor development efforts, and handle tasks that would be familiar to any foundation communications director. Wearing her other hat, Williams turns her eyes and ears to uncovering and highlighting organizations and activities that can help people give back to Austin–from how small donations can make a big difference to any one of 75 things people can do to give back to the community. Whether the topics she writes about for the magazine are connected in any way to the Austin Community Foundation–other than being in the same town–that’s pure coincidence. In her first issue for the foundation, Williams is true to the magazine’s promised editorial mission of providing a diverse range of topics that are meant to appeal to just about everyone who currently gives back or needs a tiny push. 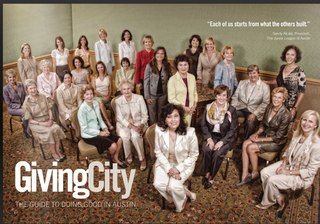 For instance, the magazine’s cover story, “This is Junior League Austin,” introduces readers to the local chapter of this national organization, made up of Austin women who are committed to and passionate about volunteering. 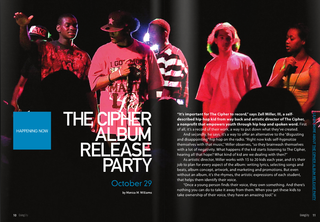 In addition to articles that offer ways to give money or time to worthy local groups, stories in the magazine profile the official in Austin charged with overseeing volunteer opportunities, showcase a local project that uses hip hop music to positively engage young people, how plans are progressing for a planetarium for the city, and a look behind the scenes at the local community radio station, KOOP. While there’s plenty in this job for Williams, what motivated the foundation to take it on? Ok, just give into the temptation, and click here to see for yourself.